My Grandma says I have “itchy feet.” Not the athlete’s foot kind of itch, but the kind of itch when your soul is filled with wanderlust for the outdoors. I guess she’s right and I came by it honestly. Generations before I was born a great migration took place and my great-great-grandmother Magrethe, found herself leaving her homeland in Denmark when she was a young girl to come to America to build a better life for our family. When she left Denmark, her father was a farmer and if you weren’t Lutheran you weren’t allowed to own land, leaving very few options for work to support a family. With that came a decision that created new opportunities for generations to follow and thus the family waved goodbye to their relatives, boarded a boat, and embarked on a journey of a lifetime. The voyage across the ocean was rough with waves crashing against the bow of the boat so hard that when Magrethe’s brothers went up on deck a wave sloshed across the deck almost taking the boys out to sea. So, when they announced arriving at the St. Lawrence River, Magrethe and the rest of the passengers were thrilled. Upon arriving in the states Magrethe continued making her way to Utah by way of two different trains and a muddy stagecoach ride through some of the roughest country her new homeland had to offer. Finally, she reached her destination in central Utah and as she stood staring out into the vast openness and bleak desert landscape, she cried. She missed her family and she had hoped for a beautiful lush landscape like what she had left behind. She made the best of her situation and made do with what she had. And as if a reward of some sort from the God’s she learned about Fruita, a green grass oasis in the center of red rock country where the Mormon pioneers were planting fruit trees in the desert. Who had heard of such a thing? That’s where Capitol Reef National Park comes in. 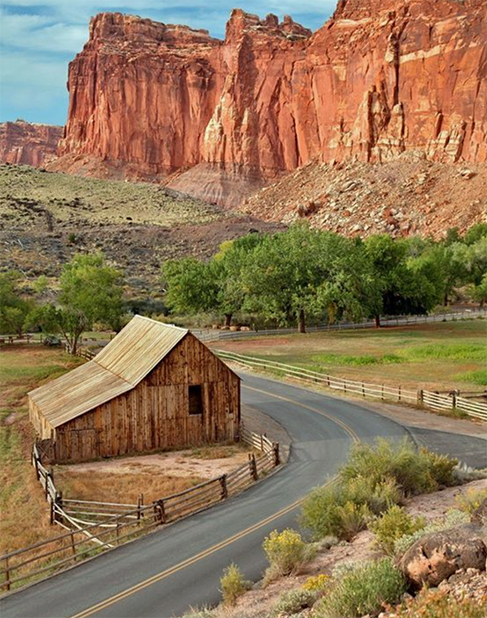 Long before it was established a National Park in 1971 Capitol Reef was home to archaic hunters and gatherers and is lush with history, petroglyphs that tell a story, green meadows, and fruit trees galore planted in the late 1800s. And just like the pioneers, Magrethe and her descendants have since enjoyed this hidden treasure situated in south-central Utah next to the town of Torrey, deep in the heart of red rock country. Capitol Reef National Park earns its spot among the acclaimed Mighty Five as a mecca for red rock lovers who like a bit of tranquility to go with their hiking. The park is full of cliffs, canyons, domes, and bridges, not to mention the Waterpocket Fold, a geologic wrinkle on earth. Not all National Parks are a hiking parks, but luck be a lady, this one is and boasts over 15 hikes but only a few trails have made it to my families list of favorites. Capitol Reef seems to have hikes that suits almost everyone, there are short to medium hikes, flat trails and those with elevation gains, and there is even a hike to a natural bridge. The most popular hikes in Capitol Reef offers a wide-variety of hiking. As we wandered around the park we made a quick stop in the historic district of Fruita where you will find deer frolicking through the campground, the Fremont river trickling downstream behind the Gifford House, a small shop-museum combo that sells ice cream and pie among other handmade trinkets. Not far from the ice cream shop you will find the Hickman Bridge trail, one of the most popular hikes in the park and makes it into my families top five; it is just right for groups with small children. Coming in at just two miles round-trip the trail follows alongside the Fremont River. Once you reach the Hickman Bridge be prepared for the awe-inspiring view of this 133-foot natural bridge. The Waterpocket Fold defines this National Park. A nearly 100-mile long warp in the Earth’s crust, the Waterpocket Fold, formed sometime between 50 and 70 million years ago, is what is known as a classic monocline with “step-up” in the rock layers. 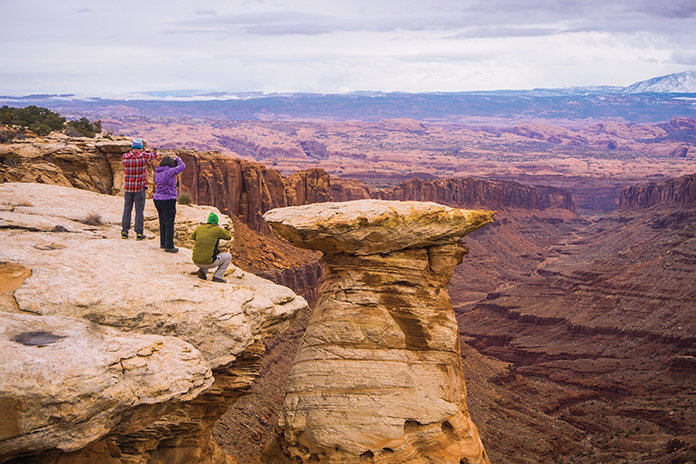 An incredible vantage point to take in this geologic feature is from the Rim Overlook Trail and Navajo Knobs, an extension of the Hickman Bridge Trail. The overlook is 2.3 miles up the trail and provides some of the best panoramic views in the park. If you decide to double the distance you will reach Navajo Knobs, a series of white sandstone spires, complete with an otherworldly appearance. While this trail has some of the best views in the park the entire trail is well marked and will take you a grueling 9.2 miles round-trip gaining well over 1,600 feet in elevation. Another short hike favorite is the Fremont River Trail. The round-trip hike is just under two miles and starts at the park’s amphitheater on a paved pathway that follows along the Fremont River. Once you travel about four-tenths of a mile into your hike, plan to start climbing a ridge. At the end, you will find an overlook to view the canyon and the river below. We continued after our stop for ice cream to Cassidy Arch, named after the famous Butch Cassidy. The arch is large and picturesque as it sits 400 feet above the scenic drive and the Grand Wash Trail. It is a great diversion on any trip and what would hiking in Utah’s Red-Rock country be without seeing an arch? The trail to Cassidy Arch starts on the slickrock for a three-and-a-half mile, round-trip journey gaining 670 feet in elevation making this a steep one. even so, it is suitable for most adults but with very steep drop offs making it not great for those who are afraid of heights. Finally, the Golden Throne, a nice four-mile, round-trip hike gaining 730 feet in elevation with beautiful views of the Henry Mountains along the way and takes you to the golden-colored Navajo sandstone around a dome-shaped mountain that happens to be one of Capitol Reef’s most-visible features. Camping in Capitol Reef is another great reason to visit and has several different campgrounds from which to choose. Even though the park is a renowned member of the Mighty Five it is far less crowded than the others in the state. If there are still too many people for your liking you can always get a free backcountry permit, generally reserved for more serious hikers who want to explore the narrow, twisting gorges, grottoes and slot canyons. I’m not certain if my great-great-grandmother hiked any or all of these trails but I know many of her loved-ones have hiked, laughed, climbed trees, and shared many of the beautiful vantage points that Capitol Reef has to offer. I can imagine Magrethe laying on the grassy lawn staring up into the dark night sky. Did I mention that Capitol Reef is a Gold-tier International Dark Sky Park? Dreaming of her family back home in Denmark, looking at the same stars they saw while they were lying on their lawn staring up at the sky, eating an ice cream with her family and picking fruit from the same trees that I picked fruit from on my last visit to the park. 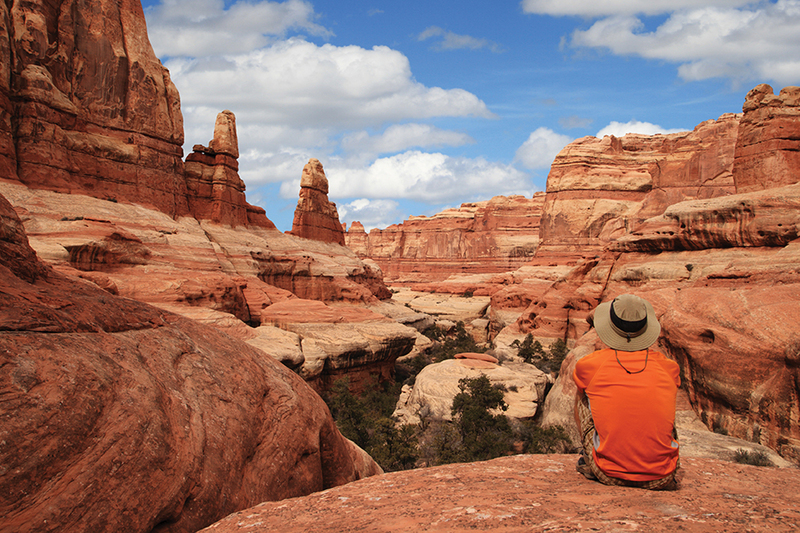 Regardless of what you do (or don’t do) on your trip to Capitol Reef, you are in for a trip of a lifetime. This park offers its natural beauty and untouched wilderness that provides you the peace of mind you hoped to find on your vacation. Capitol Reef is a special place; you can almost feel it in the air. Creating metal art with Blacksmith Adventures.